Getting a good night sleep in a noisy neighborhood is always difficult. There is always something trying to keep you awake from noisy neighbors to a snoring roommate. Disruptive and loud noises are not ideal for a good night sleep. This is why more people are turning to white machines to help keep out external noises. White noise machines are specially designed devices that produce white or static noise with randomized frequencies. The machines also produce other noise colors helping reduce the volume of each octave added. They work by jarring and blocking out loud interruptions. Some devices can help persons relax and concentrate for a good night sleep. These machines are a great choice if you live in noisy apartments and can help you get a good night sleep. They are also affordable with most ranging from 20 dollars to 100 dollars. In this post, we will help you choose the best white noise machines on the market. You can choose from a wide range of settings in these machines to find what helps you sleep better. Make sure you check out top ten best picks below before making a purchase decision. 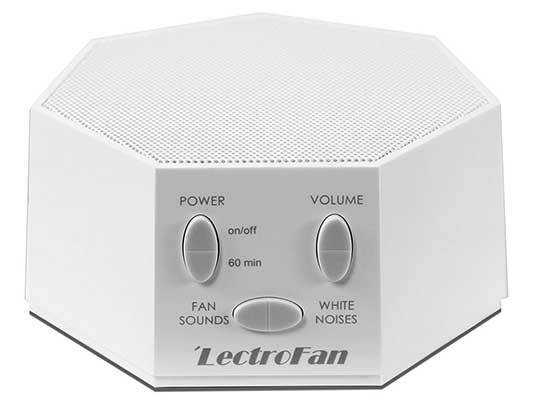 The LectroFan is by far one of the best-selling white noises machines on the market with precise volume controls. The machine features ten ambient noise variations and ten fan sounds. It also includes brown, pink and white noise. It is a quality machine that helps disrupt loud environmental noises. This way, you or your little one can fall asleep with ease. The machine is sturdily made is a solid design and powered by AC or USB power connection. Overall, this is a great white machine with dynamic and unique non-repeating sounds. It is a perfect choice for a disturbance-free area. It helps reduce overall distraction and create a relaxing day or night environment. 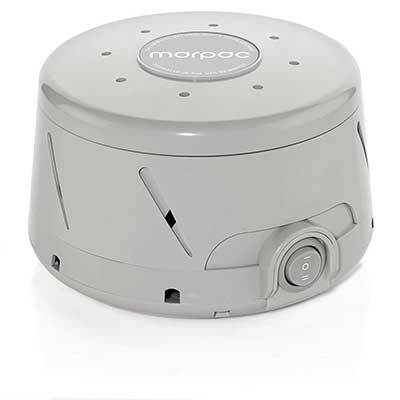 The Marpac is a leading industry white noise machine with a dual speed motor. It delivers two speeds creating soothing sounds of rushing air. The machine does this without the actual disturbance of real air moving. This is a quality machine with a real and unique asymmetrical fan. It also features adjustable features that allow users to adjust the volume and tone of the rushing air for a customized experience. The fan is safely housed in an acoustic case for added safety and durability. Overall, this is an excellent machine running on 120V ideal for domestic use. It comes with one-year limited warranty and excellent Marpac customer service. The Big Red Rooster white noise machine is another industry leader with over 7K reviews. It is a top-quality machine to buy with confidence. The machine is highly rated and recommended for use. It features 6 quality natural sleep sounds. The sounds include ocean, thunder, rain, brook, white noise and summer night. This is a versatile machine that also comes with a timer function. You can set it for the whole night or simply set it for 15, 30 and 60 minutes. 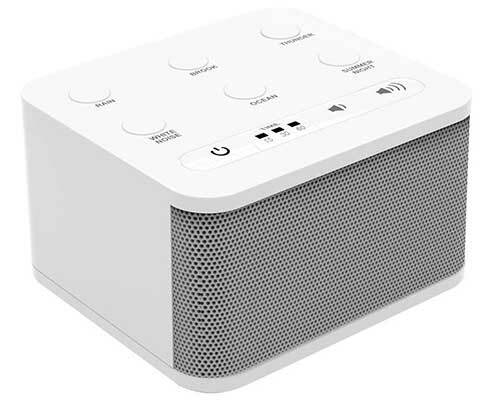 This is a portable white noise machine ideal for use at home office or when on travel. It is easy to use and comes powered by 3AA batteries or by an AC adapter. 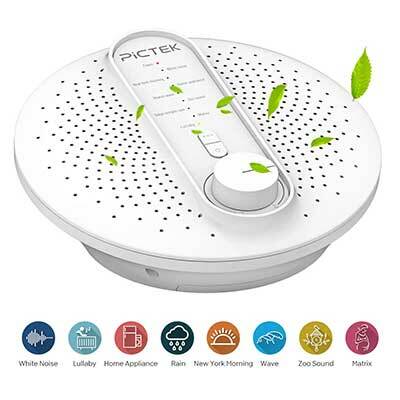 The PICTEK white noise machine is another top-rated machine to help you sleep soundly in noisy neighborhoods. It is a premium quality machine with 24 soothing nature sounds. Some of the sounds include those of birds, silence, rowing sound, cuckoo, sea waves and much more. The sounds provide you with a relaxing and lulling experience enabling you to sleep faster. The machine can be played permanently or set using a timer function to turn on and off at specific times. There is a 30 and 40 minutes time with automatic shut off helping conserve energy. Overall, this is a reliable and efficient machine with precise volume controls. It is powered through a USB, 3AAA batteries and power adapter to meet different power needs. It is also safe and highly portable for easy use everywhere. 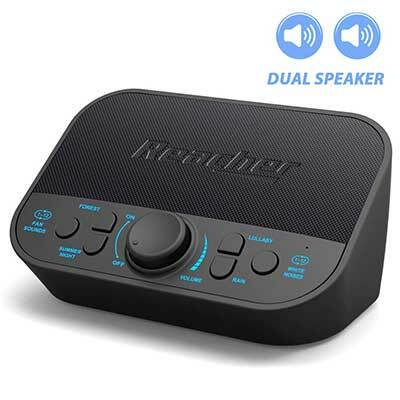 The Reacher machine is another quality white noise machine with a sleek modern design. It features 20 soothing sounds to help you sleep fast. It is a premium quality machine with a sound loop. This machine delivers 12fan sounds, 12 white noises and four nature sounds of the summer night, forest, rain and lullaby. This is a dual speaker machine with superior sound experience. The speakers are 6W and 3W for high fidelity and adaptive experiences. It also features an optional timer to help you fall asleep without thinking of turning off the machine. You can set the timer for 15, 30, 60 and 90 minutes depending with how fast you fall asleep. This coupled with one year warranty and 45 days money-back guarantee makes this machine a great choice to buy. 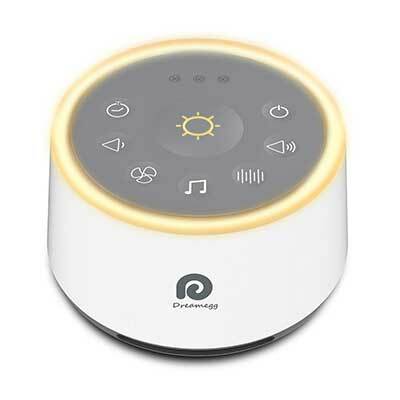 The Dreamegg is another compact and sleek design white noise machine to buy and use at home, office or when on travel. It is a high fidelity machine with 21 soothing sounds to help you relax and sleep. The machine features a built-in high-end speaker. It is a versatile machine with 7 white noises, 7 relaxing natural sounds, and 7 fan sounds. You easily get to choose a channel that works for you when ready to sleep. It also includes an optional night light to assure babies of safety. The combination of soothing sound and soothing light helps babies sleep fast. 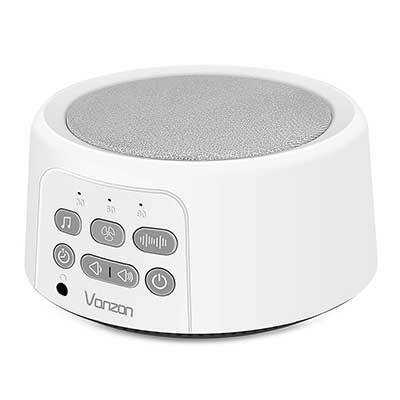 Overall, this is a compact white noise machine with timer and memory functions for easy use. The machine also comes with 365 days warranty and 60 days money back guarantee for worry-free buying. This is another quality white noise machine with advanced features for easy use. The machine features a built-in headphone for private listening without disturbing others. This is a safe and drug-free natural way to fall asleep in loud areas. It is easy to use and features a relaxing sound. The machine features 7 buttons that indicate different white noises for easy use. The buttons are individually labeled and quite easy to use. Overall, this is a high-quality machine to create a peaceful environment and block out unwanted distractions. It is a perfect choice when you need to concentrate, sleep or relax. The machine features adjustable volume controls for a customized experience. Volume adjustment is pretty easy with a simple twist of the wrist. 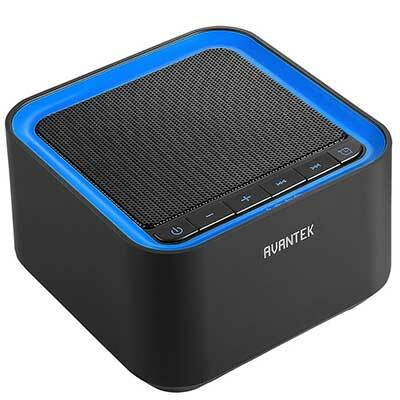 There is a USB port for charging your devices and high-quality speakers for clear sounds. The NURSAL is a sleek design portable white machine in a rectangular shape. It is a great machine with 10 natural sounds of the rainforest, summer night, waves and much more. This machine will relax and help you sleep fast. It features a memory function that enables the machine to start from the previous settings. The machine’s audio track, volume level, and timer will return to previous set settings. Overall, this is a simple white noise machine with an option for a timer or continuous use. It is powered by 2 AA batteries or DC using a USB cable. This machine is compact and ideal for travel. It also comes with 12 months warranty for confidence buying. 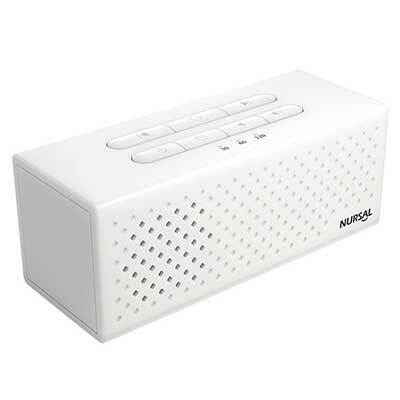 The AVANTEK is another beautiful design white noise machine with great design for easy use everywhere. This is a perfect noise machine for babies to sleep fast. It is a quality white machine with 20 soothing sounds. There are 8 nature sounds, 6 fan sounds, and 6 white noises. This is a versatile machine for babies, adults, and children. It creates a peaceful sleeping environment allowing you to sleep soundly. There is a timer and memory function for easy use. You can set the machine from 1-7 hours and sleep without worrying of battery. The machine will automatically turn off saving the battery. Overall, this is a lightweight and compact machine with 18 months warranty and 45 days money back guarantee. 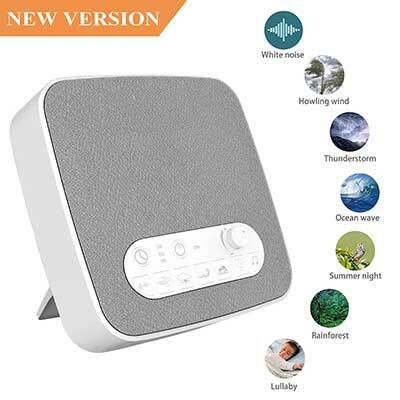 This is our last best white noise machine with 7 high fidelity nature sounds. It is a leading industry noise machine with 21 soothing sounds to help you relax and sleep. This machine is a perfect choice or sleeping babies. It masks loud environmental noise creating a peaceful sleeping environment. This is a reliable and convenient machine with three timer functions of 30, 60 and 90 minutes. It allows one to sleep soundly without worrying about turning it off. The machine design is compact and portable allowing for easy storage and transportation. There are so many different features with each white noise machine making it pretty difficult to choose the right one. The cost of each white noise machine model varies depending on the specifications and brand. In this section, we look at some of the basic features to consider. You need to choose a white noise machine with adjustable noise settings. Such machines are easier to use and control. They also allow for easy volume adjustment to your liking. The traditional white noise machines usually have white sounds. However, some of the latest machines feature different sound options. Some of the added sound options include ambient and natural sounds. When choosing a white noise machine, choose one with a considerate size to fit perfectly in your home. Most machines are usually compact and measure about 10L by 10W by 10H. Small size machines are preferred since they occupy little space. This is an added feature in white noise machines to create less distraction. The machines usually mask their sound loops creating a continuous listening experience. A built-in headphone jack is a great consideration if you want to use the machine in public or for private listening. Some machines feature alarm programs for automatic start and stop. You also need to consider the machine power source. Some machines use batteries while others require an electrical power source. White noise machines are a perfect choice for persons dealing with noise pollution. They are a perfect pick for persons on travel. Some of the advanced models come with a headphone jack where you can plug in and listen to them in traffic. People who sleep in noisy areas can also use them at night to reduce noise levels and relax the environment. They are a must-have in homes with newborns and infants. Generally getting a white noise machine is a great idea if you live in noisy neighborhoods.